Jack Farley, the Wilmette Fleet Historian, owned Celerity for 35 years. He sent in the following aerial photo and description of a maneuver they use to simplify jibing and spinnaker takedowns. "Celerity with spinnaker after rounding the 1st Mark. Carl Ahmer starting to roll the Genoa around forestay. Makes it easier on the gybe and at spinnaker take down. Works for us. Note 9.25' foot on the main vs old sail plan. 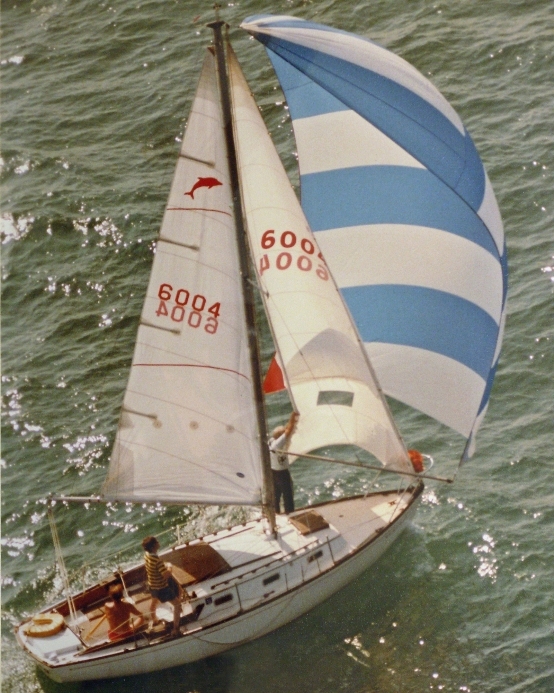 Fleet adapted new sail plan in 1975."